Vehicles cross over the Pharr-Reynosa International bridge on Wedneday, July 18, 2018, in Weslaco. A panel of U.S. Senators on Wednesday heard testimony from two South Texans regarding international trade, international bridges and the North American Free Trade Agreement. Representing the region in Washington, D.C. were Pete Saenz, mayor of Laredo and chairman of the Texas Border Coalition, and Sergio Contreras, president of the Rio Grande Valley Partnership, the business collaboration organization based in Weslaco. 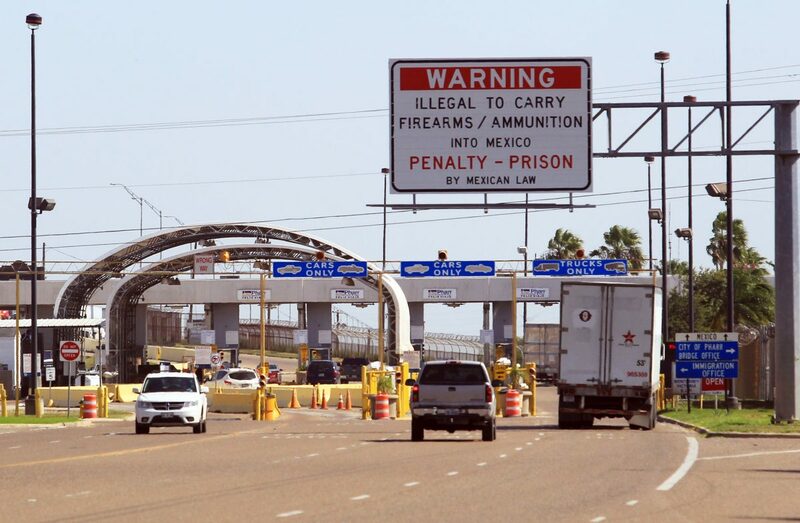 Contreras, however, appeared in his capacity as the vice chairman of the Border Trade Alliance, an organization focusing on issues regarding the border regions of the county’s two neighbors. After explaining the vast impact of trade between the United States and its southern neighbor — 5 million jobs depend on trade with Mexico — Contreras told the senate panel that Customs and Border Protection has a hiring problem. U.S. Sen. John Cornyn didn’t disagree. The Texas senator chairs the committee Contreras and Saenz appeared before on Wednesday: the Senate Finance Committee’s Subcommittee on International Trade, Customs and Global Competitiveness. “CBP hiring takes too long, and it has too many unfilled positions,” Contreras said, before citing two previous Congressional hearings in recent years that acknowledged the agency’s 18-month hiring process is challenging to its recruitment efforts and that CBP’s employee union has over 1,000 open positions. Saenz reiterated Contreras’ concerns. Saenz said in 2015, CBP collected an estimated $46 billion in revenue, the second highest generating government agency. “We share the concern expressed by the National Treasury Employees Union that these revenues are utilized in funding other priority federal programs creating a lack of resources devoted to CBP’s trade functions and ultimately an economic loss for American companies,” he said. The conversation turned to NAFTA, the two-decade old pact that President Trump called “the worse deal ever made” during his presidential campaign. Canada, Mexico and the United States began renegotiating the agreement last August, but talks have stalled. There hasn’t been a formal negotiating round since the spring. “Is it fair to say that the Rio Grande Valley continues to see strong growth because of NAFTA?” Cornyn said. Saenz remarked repeatedly how important NAFTA was to not just border regions, but Canada, Mexico and the United States. Texas’ 20 ports of entry account for $650 billion in international trade, Saenz added.